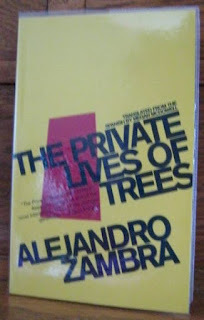 'The Private Lives of Trees' by Alejandro Zambra is a strange little book that I read (as recommended) in one sitting on Tuesday morning. It is less than 100 pages but packs a lot of emotional impact into them. Julián meets Verónica by chance when he arranges for her to bake a cake for his girlfriend, a relationship that is already disintegrating without him realising. The book covers a few hours of his life as he is watching over his stepdaughter Daniela and awaiting Verónica's return from an evening class, and as the night passes he reflects on his own history and tells Daniela stories about trees. It is just a lovely understated little book that works its way under your skin and leaves you wanting things to turn out better for Julián. He is sympathetic because he does not want much from life; he notices insignificant things, and makes them more significant in telling about them. As it gradually becomes apparent that Verónica is not returning he begins to dwell on what the future might hold for Daniela and the line becomes a little blurred as to whether he is living through this fateful night or remembering it from some point in the future. Though written by a Chilean writer I did not get a sense of anything 'foreign' about it, it is very much about the character of Julián.